The Elcometer 113 Magnetic Thermometer continuously indicates the surface temperature of steel and other magnetic material. The thermometers are based on a bimetallic strip and therefore do not require batteries but do require time to adjust to the temperature. Available in a number of scale ranges, this is also available as an economy version. Type: Rigid Stem & Every Angle (External Zero Adjustment with Every Angle Version). Nominal Size: 63mm, 100mm & 150mm. Accuracy Class: +/- 1% of FSD. Case & Bezel: SS304 Weather Proof to IP-55 & 65 as per IEC-60529, Drawn Steel Black Powder Coated. We are engaged in manufacturing a wide range of Metal Armoured & Encased Thermometers. These are straight inclusion type thermometers, used for Ships and Engines. These are made of brass, aluminum and mild steel. The metal provided with these thermometers gives the capacity to withstand shocks and vibrations. 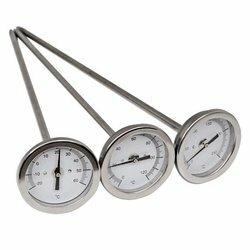 The Bimetal Thermometer is suitable for rising the bourdon tube pressure gauges and force transmitters. The Rototherm range of heavy duty bimetallic thermometers combine robust construction, that makes these instruments suitable for the most stringent environmental conditions, together with an accurately manufactured bimetallic coil, which enables each instrument to ensure a long dependable life.